In this dark, haunting tale, Richard Merton recounts the story of his close friend, Tony, a young lawyer recently returned from the war, and the subtle, sinister destruction of his personality by his servant, Barrett. Seeking ease and comfort, Tony hires Barrett to cater to his needs, not realizing that his new servant has a hidden agenda. As Barrett gradually and insidiously leads his employer into physical and moral degradation, the roles of master and servant will become grotesquely reversed. 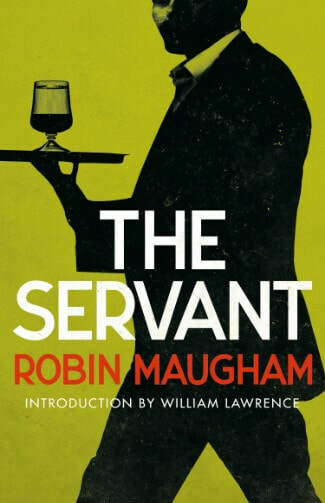 Robin Maugham’s modern classic The Servant (1948) was hailed by The New York Times as ‘a masterpiece of writing’ and was adapted for a celebrated 1963 film version directed by Joseph Losey and scripted by Harold Pinter. This new edition includes a preface by Maugham from the 1973 edition explaining the origins of the novel and a new introduction by William Lawrence. Preorder now. Available June 11th. Robin Maugham was born Robert Cecil Romer Maugham in 1916, the son of Frederic Maugham, 1st Viscount Maugham, and Helen Romer, and nephew of the famous author W. Somerset Maugham. Educated at Eton and Cambridge, Maugham trained as a barrister but instead decided to follow in his uncle’s footsteps and pursue a career in literature. Maugham served with distinction in World War II in North Africa, where he reportedly saved the lives of 40 men and sustained a head injury that resulted in blackouts. While convalescing from his wounds, Maugham wrote his first book, Come to Dust (1945), which drew on his war experiences. The book was praised by Graham Greene and sold well, convincing Maugham to continue writing full time. Over the next thirty years, Maugham would be one of England’s most popular writers, publishing some twenty volumes of fiction and a dozen nonfiction works, including travel writing, biographies of his uncle, and the autobiography Escape from the Shadows (1972), which dealt frankly with the three “shadows” over Maugham’s life: his father, his uncle, and his own homosexuality. Maugham was also a prolific playwright, writing scripts for stage, radio, and television. Among his many works, highlights include the classic novella The Servant (1948), memorably filmed by Joseph Losey in 1963; Line on Ginger (1949), filmed as The Intruder (1953); The Wrong People (1967), a controversial novel dealing with pederasty and initially published pseudonymously, and The Link: A Victorian Mystery (1969), loosely based on the real-life Tichborne case. On the death of his father in 1958, Maugham succeeded to the viscountcy, becoming the 2nd Viscount Maugham. His first speech in the House of Lords drew attention to the subject of human trafficking and led to a book on the subject, The Slaves of Timbuktu (1961). He traveled widely, living for ten years on the island of Ibiza, but towards the end of his life his health deteriorated due to diabetes and alcoholism. He died in Brighton in 1981.